It’s hard to be chic when you are up to your elbows in laundry, let alone when your youngest starts scratching wildly at her head after weeks in day camp at the height of summer. Well, that’s how my long-awaited trip to London began, or the preparation time at least when I should have been laying out the clothes I would pack, and styling them with shoes and accessories, a raincoat, umbrella … all those precautionary things you need for London. Instead, I was confronted for the first time ever with the biting reality of head lice. My 5 year-old complained her head itched, which given the heat and her very long hair, wasn’t anything unusual. I had never seen lice, but a closer look at her head suggested something was wrong – something seemed to move, or was I imagining it? There was no time to muck around, so off to the appropriately nicknamed “lice lady” we went. In Boro Park, Brooklyn, in a self-contained primarily Orthodox Jewish community, the lice lady and her family lives. There are daughters and daughters-in-law aplenty who help out too, picking heads searching for lice and then combing them out with tedious but effective (and pricey!) precision. My daughter, it turned out, was infested with live bugs – probably acquired at her very nice day camp. My son and I, thankfully, were all clear. But what happened next was like a military operation and not what I needed one day before delivering the children to their grandparents’ house and setting off for our first grown-up trip overseas sans kids. Bedding, cushions, clothing, dolls – anything my daughter had contact with had to be washed. And what couldn’t be washed and dried at high heat had to be bagged and sealed for several weeks, so anything lurking would die. My daughter’s hair still had to be monitored, so grandma was armed with a big bottle of Pantene – the conditioner of choice because it’s thick enough to coat the hairs, and the delousing crew informed me you can get huge bottles at Costco – and a sturdy German-made “lice comb” to torture dear daughter with daily. The initial head check and subsequent comb through for a 5 year old with very long hair, in case you wonder, was about $175 and the comb, another $25. Somehow it worked out to another $70 each for my son and I to be combed through with conditioner. It’s a cash-preferred business, but if you don’t happen to have $300-plus on you, they will accept a check. This, I have decided, is a business to be seriously considered, though probably not by clean-freak, type-A personalities (like me). As part of the overall service, my daughter went back for a head check the following day and was declared all clear; my son and I have yet to return for a final checking but that also was included in the price. I was told that London is crawling with lice, so I really should return for a post-trip check. Ahh, the glamor of international travel these days: if it’s not lice, then beware the bed bugs. Needless to say, a week away was much needed. And needless to say, in the midst of a delousing operation, I packed completely inappropriately. The scorching heat in New York addled my brain and had me stocked with flimsy sundresses and open-toe wedges for London, instead of layers, and rain-wear and at least one pair of closed shoes. I froze, I was rained on and my feet were splattered with mud on long walks through Hyde Park. But none of that mattered. And we’re back now to cooler weather and lice-free kids. A sign in the window at shuttered Cube 63 on 234 Court Street announces that another eatery, Brucie, is coming soon. No further details yet. Strong Place gastropub has just opened (July 26) in the old Shakespeare’s Sister location at 270 Court Street. The team at Cobble Hill’s Bocca Lupo is behind the new spot, which boasts a seafood-meat rich menu and some 24 beers on tap. Word is a garden area is planned as well, possibly through September. 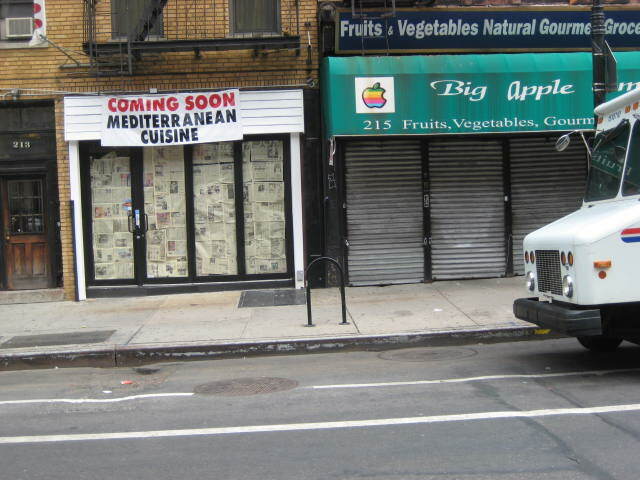 On Smith Street, there is a new Mediterranean-style restaurant in the works, adjacent the Big Apple deli that has just shutdown after a speedy “buy one, get one free” clearance sale. This is especially annoying since it’s where my husband has long picked up icecream for me on his way home from work late at night, and it was really the only well-stocked deli on the stretch between the subway station on Warren Street and Degraw Street that opened late. Across the way at 208 Smith there is another casualty. Rocketship – the geeky comic/anime store is finally gone for good after a string of lengthy, unexplained closures signaled something was wrong in the land of graphic novels. It’s a shame – my 7 year-old-son loved stopping in there on weekends to choose some quirky book with great drawings and impossibly small print.